これによりホーニングおよび、ボーリングの加工精度と、その後のエンジン組付精度は著しく向上します。 However cylinder horning, boring, and measurement have performed to the single engine block, when cylinder head is attached and head bolt is actually assembled, numerical value and form of the engine block will be changed from modification or distortion of each part in 0.01mm degree. 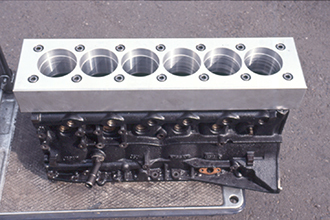 Therefore, in case cylinder horning and boring are performed strictly, the statement of the engine block that the head gasket and the cylinder head is attached, have to be reproduced by assembling dummy head and gasket. Thereby, the processing accuracy of horning and drilling, and the accuracy of subsequent engine assembly will be improved remarkably. TOMEIのプラトーホーニングは、このクロスハッチの状態から溝の頂部のみを研摩し、表面をフラットにするもので、これにより、オイルの保持をしつつ、フリクションロスを著しく低減することが可能です。 In general horning, crosshatch pattern is grooved to the surface of the wall of the cylinder to remaining oil for the smoother piston movement. However, in this method, roughness of the cylinder wall surface becomes larger and will not fit with the piston ring, but will become resistance of piston movement rather. 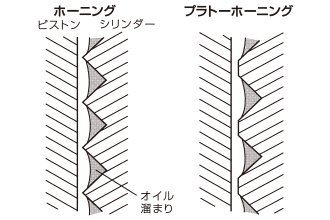 Plateau horning of TOMEI can reduce friction loss remarkably by grinding off only the apex of the grooves from the crosshatch, making the surface of the cylinder wall flat while keeping oil between the grooves. to the aluminium engine block. for the dummy head horning. for the greater accuracy of modification. ・Additional charge for the flat engines.